Ingredients: ENRICHED FLOUR (WHEAT FLOUR, NIACIN, REDUCED IRON, THIAMIN MONONITRTRATE [VITAMIN B1], RIBOFLAVIN (VITAMIN B2), FOLIC ACID), PEANUT BUTTER (ROASTED PEANUTS), SOYBEAN OIL WITH TBHQ FOR FRESHNESS, SUGAR, HIGH FRUCTOSE CORN SYRUP, DEXTROSE, CONTAINS TWO PERCENT OR LESS OF SALT, MALTED BARLEY FLOUR, LEAVENING (BAKING SODA, MONOCALCIUM PHOSPHATE, SODIUM ACID PYROOPHOSPHATE), SOY LECITHIN, CORNSTARCH, YELLOW #6, CHEDDAR CHEESE (PASTEURIZED MILK, CHEESE CULTURES, SALT, ENZYMES), WHEY, BUTTERMILK, DISODIUM PHOSPHATE, RED PEPPER. It is a yummy snack! 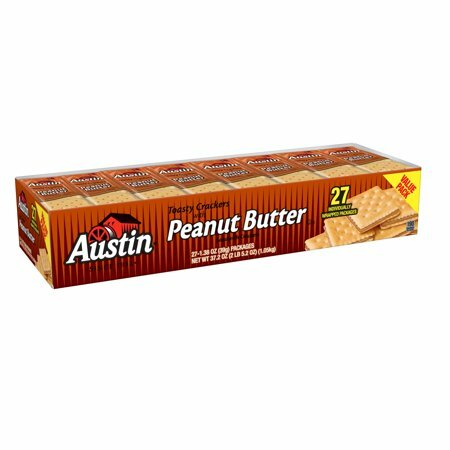 I have been buying Austin peanut butter crackers for many years. They are an excellent snack to hold over hungry teenagers/hubby before dinner is done. We also take them to work for when the munchies hit. And when we are traveling in our RV. A healthy portion-controlled snack that is reasonably priced. A winner all the way around! 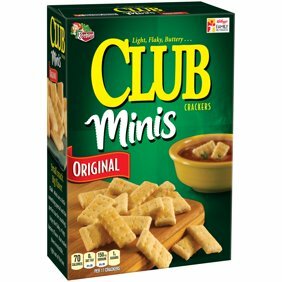 these are a great snack in the afternoon and buying a package with this quantity at this price is a great deal!